Siemens. 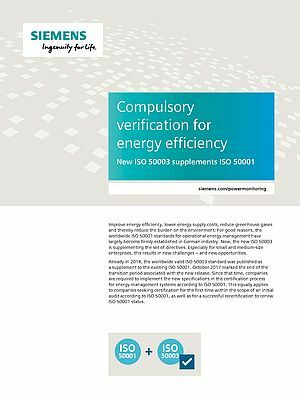 Improve energy efficiency, lower energy supply costs, reduce greenhouse gases and thereby reduce the burden on the environment: For good reasons, the worldwide ISO 50001 standards for operational energy management have largely become firmly established in German industry. Now, the new ISO 50003 is supplementing the set of directives. Especially for small and medium-size enterprises, this results in new challenges – and new opportunities. Already in 2014, the worldwide valid ISO 50003 standard was published as a supplement to the existing ISO 50001. October 2017 marked the end of the transition period associated with the new release. Since that time, companies are required to implement the new specifications in the certification process for energy management systems according to ISO 50001.